A few days before the race, I emailed Marni and Karel and told them that I had zero expectations for this race. This was my bonus race. I was just going to go out and do what I love to do- and that is swim, bike, and run! Spoiler alert: I had the absolute best day out there, truly finding the joy in what I was doing at every moment throughout the day. No, this wasn’t my fastest half iron by any means. But I felt strong and happy all day long. THIS is why I do this, I thought to myself over and over again, this feeling. I wish I could just bottle it up and come back to this every time I race. My alarm went off and I was up and ready to go! Today I GET to race at the World Championships! I had my normal pre-race breakfast of overnight oats with a banana, peanut butter, and a little bit of jam. Normally, I’d use honey for some sweetness, but we had traveled with PB & J for sandwiches on the road, so jam it was! I packed my wetsuit, speed suit, bike nutrition, bike computer, and clothes for after the race into my new swag bag and we hit the road. We were on our way to the race site by 5:30, since I wasn’t sure how bad traffic was going to be once we got close, and we were picking up my friend Shannon from her hotel at 6. It was a beautiful morning- cool with just a little breeze. Bill dropped us off at the Village and we made our way over to transition. This was so exciting! The race morning vibe felt slightly different than on a co-ed race day. I can’t place my finger on exactly what it was, but it was a good different! Once in transition, I found my bike, put all my nutrition and computer on my bike and then I pumped the tires. I was trying to take in every moment of this experience, even while setting up in transition. I also found out that the water was officially wetsuit legal! It was a little bitter sweet to hear this- sure, I appreciated the buoyancy, but as a strong swimmer, a non wetsuit swim would work to my advantage against the competition. After I was all set up, I saw my TriMarni teammate Natalie who told me Marni had passed out while getting ready this morning and she wasn’t going to race. You can read Marni’s full recap for the details, but hearing this made me so, so sad. I knew how hard Marni had been working this season, and that this was her key race. It broke my heart to hear this, but I made a promise to myself to race hard on her behalf. Shannon and I headed out of transition together after several stops at the port potties which, yes, were cleaner than co-ed races;-) We had plenty of time to sit and relax before getting in a warm up jog, more bathroom breaks, finding our spectators, getting on our wetsuits, and finally heading into the corral. Our wave was at 8:11 (pros went off at 7:30), so we had a bit of time before it was actually “go” time. We lined up in the corral and received our swim caps (apparently an issue with the vendor, which is why we didn’t get them at check in.) We met a few other SOAS ladies (hi Ashley and Allison!) before they started to move us into the pen. I started getting a little teary eyed here- nerves and excitement all rolled in to one! Waves were done as a rolling start- so you seeded yourself with swimmers of approximately the same speed. I lined up at the back of the 28-30 minute group, since that’s where I’ve been this season. Shannon and I had earlier wondered if we should seed according to where we normally would be or by what our expected time with the current would be. We both opted to go with our “normal” groups- so she was a bit in front of me. I was shocked by how many people were lining up with the groups ahead of me, but I guess that would make sense for a race with the best in the world. Soon, our corral moved into position. They were letting 10 or so athletes onto the starting dock at a time, every 15 seconds or so (maybe?) and we each lined up in a “lane” of sorts. It kind of reminded me of the holding area when you’re waiting in line for a roller coaster 🙂 The lanes to the right (most upstream, closest to the buoy) had lines of 4-5 women, while the lanes to the left (most down stream) were less desirable and never really built up a line. Soon, I found myself in a group that was let down to line up. Though I wanted to get what I thought was the best lane position (upstream), there were only 2 people in the lane to the farthest on the left, and race organizers were trying to get us to go to the lanes in the left. I figured it wouldn’t hurt me that much to start 10 feet to the left, so into the last lane I went. *BEEP* the first girl in my lane dove in. 10 seconds later, *BEEP* the girl in front of me went. 10…9…8…There I was standing jittering in line, ready to start my day at the world championships. A million thoughts were running through my head as I waited for my turn- How bad was the current? What if I dive and my goggles fill up? Lick, lick get the fog off the goggles. How fast are all these other girls? I dove in, thankfully without filling my goggles with water. I immediately started swimming, sighting frequently and trying to get into a better position. Thankfully, with the seeded start, it wasn’t a mad house right at the start! I was quickly able to fall into my groove. Swim, swim, swim, sight. Swim, swim, swim, sight. I was super thankful for all the open water drills Marni has been giving me- frequent sighting was so normal, and so very necessary! Soon, I began to catch a few girls who dove in the group in front of me. I couldn’t feel how strong the current was, but I tried not to focus on it, since it was out of my control. Just swim, and ENJOY the swim. After making the first turn, you started to swim into the sun. It was nearly impossible to sight, but I kept trying to find the buoy every few strokes. I really really wish I had counted the number of archways on the bridge so I knew which one I should be targeting to go under, and which side (to the north or south side of it) I should try to be closer to. Oh well, lesson learned! I definitely felt the current on this length, but just focused on having a decent course and not going too hard. I finally reached the next turn buoy to head back with the current and I was so excited. Now for the fun part! But I was also a little bummed that this meant the swim was going to be done soon. Not because the swim is my favorite part, but more because this part of my world championship day would be coming to a close and I wanted to take in every single second and make this experience last. But, I wasn’t going to slow down, so I kept swimming, enjoying the benefit of the current. Soon – very soon actually (for the last 700 yards of the race I averaged between 1:15 -1:19 per 100, while the other sections I averaged between 1:29-1:38!) – I reached the finish line and carefully exited up the steps with a smile on my face. I let the wetsuit peelers help me with my wetsuit, and then, after nearly running down the wrong aisle, I ran down the correct aisle and grabbed my bike bag. Up the ramp and into the little changing area, I sat down and dumped my bag. I methodically put my Skratch chews in my kit pocket, put on my shoes, helmet and sunglasses, and then shoved my wetsuit back in the bag. I handed it to a volunteer and then headed for my bike. Running with my bike shoes on was a little awkward; I was a teeny bit nervous my clumsy self would roll my ankle again, but thankfully I didn’t. As I got closer to my rack, I saw all the empty racks from the earlier waves, but I saw one bike I immediately recognized. It made me sad to see Marni’s Trek sitting alone on the rack, but I knew she had made the right decision not to race. I grabbed my bike, noticing that Shannon’s bike was already gone, but there were a number of other bikes still in the rack. Alright Steph, let’s go get after that mountain! As soon as I was out of transition, I heard my TriMarni teammates Meredith and Peggy cheering me on. This put a huge smile on my face, and I was off! Before the race Marni had reminded me to be patient. I have a habit of going after it right away- see my race report from Wisconsin to know my HR was 170 very soon after starting the bike. So, this first part of the ride leading up to the climb, I focused on not letting my heart rate get too high. High heart rate from the beginning of the race would be bad news. When I got to the climb, just like when I previewed it the day before, I clicked into my lowest gear and just rode. I was NOT going to be hard on myself and I had no expectations of time, just ride. This is fun! You love this! You GET to do this! Lots of people were passing me, but I didn’t let it get in my head. Shortly up the climb, someone started cheering for me. It was @Sallaboutme, a fellow triathlete I follow on Instagram! I waved and was just so happy to randomly see someone cheering for me on the mountain. THIS IS JUST GREAT! I made the left turn at the top and WHEEEEE downhill I went. No, not entirely down the mountain- we still had some more climbing to do, but it was a nice reprieve from the climbing. The back half of the mountain was a bunch of rollers, and I was just out there having a blast. Back in July, I had read Maria’s post about her experience in Placid, where she was out to have all the fun. Well, that’s what I was going to do today- have ALLLLLLLL the fun. On the real downhill on the back of the mountain, I’m pretty sure I actually yelled “WHHHHHEEEEEEE,” and one photographer commented about my smile and I yelled back “I’m just happy to be here- I’m at the WORLD CHAMPIONSHIPS!”. Not even the headwind on the boring/flat part of the ride got me down. I thanked the volunteers manning the intersections, and cheered on women that passed me (which happened MUCH more than me passing). My tummy was feeling great and I was nailing my nutrition. This was fantastic! In fact, I was having such a good time that I got a little bummed when I saw mile 40. I only had 16 miles left of this part of the race. But I told myself to finish strong and continue to be present in this day! Soon, I was back downtown and headed towards transition. I can’t believe I’m about to start the last part of my race! A bike catcher grabbed my bike, so I ran off to the changing area to grab my run bag. Again, I dumped it on the ground and put on my shoes & socks, hat, race number and fuel belt and shoved everything else back in to the bag. I gave the bag to the volunteer and headed out. It was fun having a changing area- I probably took a little more time than I should have in transition because of it, but I didn’t feel stressed out and the normal “go, go, go” of a regular transition. Maybe it was just because I was taking it all in? I ran out of transition, and out the short out and back where it was clear they just were adding on that little bit more to make the 13.1 distance. I spotted my SOAS teammate Amanda, cheering me on so loudly! She asked about the bike and I told her I loved it! I was seriously on cloud 9 as I started this run. This short, flat part didn’t last long, and soon I was climbing up my first hill. I had a goofy smile on my face and all of the sudden someone was running next to me. OMG it was Bill! He asked me how I was feeling and I said “I feel great!” I’m fairly confident this is the ONLY HIM I’ve ever done where I started the run feeling great. I think that means I paced the bike appropriately;) We exchanged a few more words of encouragement before he split off and I kept running. The run was a two loop course- The first part was along a highway parallel to the river, and the we cut back towards downtown on a lovely riverside path before making a sharp right over a bridge and then up a really long hill. On the other side of the river, we ran through neighborhoods, enjoyed some more hills before coming back over the wooden foot bridge and doing it all over again. Before the race I hadn’t really studied the course much; I knew it was going to be hard, and there was nothing I could do about it, so I just let myself experience it and draw my own conclusions. Yes, it was a hard course, but I think I had built it up in my head so much, that those expectations, combined with my positive attitude on race day, made it seem not so bad! As I ran along the highway, I just told myself to run happy. I wasn’t bothering to look at my watch either; I didn’t want to know my pace because it didn’t matter. And, one of my biggest hurdles in my HIM is the pressure I’ve put on myself to break 2:00 in the half marathon. Somewhere around mile 2 maybe, I did glance down and saw 8:4X and was like WHOA NELLY. Slow down Steph, you’ve got a hilly half marathon to do! I also noticed that my watch wasn’t beeping every mile- I was feeling really good on this run, and I really wanted to know what my splits were when the race was done, so at the 5K mark, I hit the lap button. BUZZZ!!! I looked down at my watch- “TRIATHLON COMPLETE.” No, no no!! I didn’t finish the race! I just want to know my splits when I was done! I quickly pressed the lap button again (or start, not sure which I pressed to get the time to time to keep going) and thought, well, that’s my sign to just leave my watch alone! The run back along the river was nice- there was one hill (the Red Bull hill I’ll call it, because that’s where they set up), but it was mostly flat and had a lot of shade. I made the sharp right to head out over the bridge, and guess who I saw again? BILL! He ran with me again, asked how I was feeling and if I was hydrating enough. My response was, “I’ve already peed on myself twice.” Yes, that’s the reality of triathlon. Fatigue was starting to set in a little, but I was still feeling good- like I was shocked at how good I was feeling. I just kept smiling, enjoying my moment at Worlds. Just on the other side of the bridge, there was a really long hill, but the aid station at the start of it was rockin’ and gave you a mental boost before heading up it. I nailed this long climb- I DIDN’T WALK! !- and then made the right turn to see one of my favorite aid stations. It was Hawaiian/Tiki themed and everyone was cheering SO LOUDLY. There was a girl in a wheelchair with a lei around her neck and a sign indicating that she was the high five station. I cut across the road and made a point to give her a high five. I thanked the other volunteers, did a little dance and kept going. Shortly after this aid station was another hill. Up ahead on the hill I saw two SOAS kits. I was still feeling good, so I ran up between them, smacked them on the booty and cheered. It was Shannon and Adrienne, and they were on a short walk break up a hill. Once at the top (or maybe near the top), I heard Shannon yell, “I’m coming Steph!”- Soon she caught up to me, and told me her back had been bothering her after that ride. Bummer, cuz she’s super speedy, and was not having the day I know she wanted to have. We ran for a little and then gave ourselves permission to walk up the next little hill before running again. She and I ran together for the next two miles or so (walking the aid stations, as I had been), until I needed to stop and tie my shoes at the aid station back on the first part of the loop, along the highway. I was still doing well both effort wise and tummy wise at this point. I was drinking my skratch, taking in water and ice at aid stations, because it was starting to get hot, and walking through the aid stations. Usually by this point I would be drinking coke, and I had yet to grab the liquid gold. I just kept going, reminding myself to keep good form – Run pretty Steph – whenever I started to feel myself getting sloppy/tired. The second loop didn’t feel quite as good as my first, but it still felt good. My TriMarni teammate Natalie caught me on the shaded area along the river, before the right turn to go over the bridge. We gave each other some encouragement, she told me she had flatted on the bike (bummer!) but she was still doing well. It was fun to see her out on the course! As I was running over the bridge the second time, there weren’t quite as many athletes around me as there had been the first lap. I realized that I was definitely in the back half of the athletes. Just then a spectator cheered, “You deserve to be here!” This was exactly what I needed to hear. Even though I had never voiced feeling a little like I didn’t belong, there was a teeny tiny part of me that felt that way because I didn’t qualify the “normal” way. The typical ice breaker question at this event was, “Oh, where’d you qualify?” I was always a little awkward in my response. So when I heard this guy cheer, in my head I thought to myself, “Yea, I DO deserve to be here,” and I continued to run strong across the bridge. Over the bridge, up the hill, past the Hawaiian aide station (being sure to high five the girl), over a few more rollers, around and under a bridge, through the little downtown-y part, and back over the pedestrian bridge. I was almost there! I turned up the effort a little bit when I got over the bridge because I knew I was so close to the finish! Now was the time to soak it all in. Soon, I reached the red carpet. There were a few other people coming in at the same time as me, and I’m not going to lie I was torn between running hard to the finish and slowing a little so that I could get a good finish picture. I ended up somewhere in the middle of those two options, but still finished with a huge smile on my face. I HAD DONE IT! If you hadn’t already noticed (or hadn’t stopped reading because this post reeks of rainbows and butterflies), I was so happy with my day. As it turned out, this was my fastest half marathon at the end of a HIM AND I hadn’t needed Coke to get me through. WHAT WHAT?? I was SUPER proud of this run, and the whole race. I enjoyed every minute of the day, and this was a huge confidence booster for me and my ability to a) put together a solid run and b) handle hills. I told Marni and Karel after the race that maybe I had been too conservative, but they assured me that I had done everything just right. I raced with joy and gratitude, and it changed everything for me. I seriously hope that I will replicate my attitude from the WC race at every race from this point forward because it really made all the difference. I cannot wait to race again in a few weeks in North Carolina at my last race of the season! 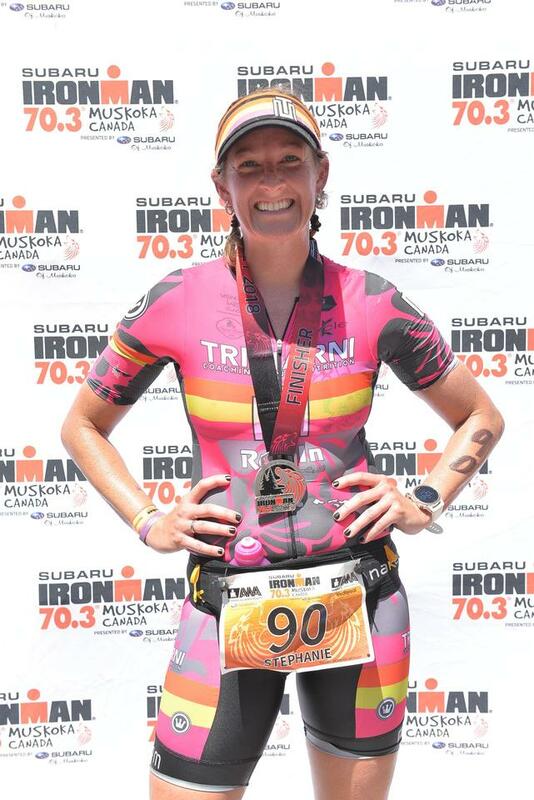 Back in July, I received an unexpected email from Women For Tri inviting me to participate in the Ironman 70.3 World Championships. Without another race on my schedule until October, my response was HECK YES! Still feeling a little bummed from my less than stellar performance in June and lacking motivation to train since my next race wasn’t for a few more months, this was exactly what I needed. I knew going into this race that this course was not suited to my strengths (exception: swim). The course for the World Championships was planned to be different than the “regular” Ironman 70.3 they hold in Chattanooga in the spring. The swim was a loop (rather than point to point), with the majority of the swim being upstream. If you’ve heard anything about the swim in the Tennessee river, it’s likely that you’ve heard about the speedy current. Swimming with this current is what many athletes find appealing about the full IM in Chattanooga. Well, Race Directors thought it would be “fun” to have athletes swim against that current for the World Championships. The bike would have 3,408 feet of climbing (as compared to 2,218) with the first part taking you straight up Lookout Mountain. The run was most similar to the spring race, a two loop course and almost 1000 feet of climbing. This Florida girl would be way out of her comfort zone at this race, but I did what I could in my training, completing some run workouts on bridges and some longer rides out in San Antonio (FL) where there are some hills. The two weeks leading up to this race were less than ideal. I was out for a run one evening, and less than a quarter mile into my run, I rolled my ankle. Thankfully, it ended up being a minor sprain and I was back running in a week, but the Type A athlete in me was freaking out from the minute it happened. A weekend COMPLETELY off two weeks before a race? The horror! I think it actually ended up being really good for me to rest up! We left for Chatty on Wednesday night around 10:30pm for the Saturday race (women were Saturday, men were Sunday). Our original plan before Irma was a thing was to drive for several hours and then grab a hotel wherever we decided to stop. Well, thanks to evacuation orders, at 1am the roads were like rush hour, and there were ZERO hotels anywhere with vacancies. We drove (well, mostly Bill drove) until 4:30am before stopping at an overflowing rest area for a two hour nap before hitting the road again. The kitties were not pleased with this whole situation so they were meowing for most of these two hours. Not ideal 3 nights out from a race. We FINALLY arrived in Chattanooga mid-afternoon on Thursday. Exhausted, we dropped our things at the hotel, grabbed some food, and then immediately took a nap. I didn’t want to sleep too long, for fear of not being able to get back to bed that night (and Thursday night was the night before the night before- the most important night to get sleep!) but man, did it feel good to lay down on a bed. After about a hour and a half/two hours, we slowly got out of bed to head down to the race site so I could get checked in and then go to the welcome banquet and pre-race meeting. From the minute we got close to the race site you could feel the excitement. There were signs of Ironman everywhere- Billboards, the M-dot on top of the aquarium, and lots of very, very fit people walking around. Bill dropped me at Ironman Village so I could check in- I wandered through the maze of vendors and loved hearing different languages spoken all around. It finally hit me- I was at the World Freaking Championships. Holy cow. Check in was a breeze and IM does not skimp on swag for World Championships events. I took some photos and held off on merch (for now) before finding Bill and making our way to the convention center at the Marriott for the welcome banquet. The spread at the welcome banquet was decent- salad, fruit, mac n cheese, potato salad, cornbread, bbq pork, chicken, pecan pie and brownies. Not the best for vegetarians, but I made it work. After the welcome banquet, they had the pre-race meeting, where we received the welcome news that they were going to do something to the dam up the river so that the current would be MUCH weaker than it currently was. They also said they’d be monitoring the water temperature closely, and would make a final call on Saturday at 5am, but water was currently not wetsuit legal. I learned that we couldn’t access our bike or run gear bags on race morning, so they needed everything in them when I dropped them off tomorrow. After the meeting, we immediately went back to our hotel (which was close to the airport, about 20 minutes from the race venue) and went to bed! I slept in as much as I could before heading in to the race venue for my pre-race workout. It was a beautiful morning- cool but sunny. It was so nice to have cooler temps! I started with a swim in the river to get a sense of the current. I knew that they said it would be less strong on race morning, but I wanted to get in and check it out. They had buoys set up to do a short loop, about 600 yards. The water was not wetsuit legal, so I put on my speed suit and waited in line to get in. I chatted it up with some friendly Wisconsinites before getting to the entrance. The water was really refreshing when I jumped in, and at first I didn’t really feel the current. As long as I was swimming, I couldn’t quite tell how “bad” it actually was. Sure, the shoreline seemed to be moving past me in slow motion, but that’s pretty normal. However, I started to run into a slower swimmer so I stopped. OH. Hello current! Immediately, I started drifting backwards. Lesson- just keep swimming! For fun, I lapped my watch when I started swimming upstream and then again when I was swimming with the current. With a few short stops on the against the current part, my pace was 2:11/yard, but on the way back (with the current) it was 1:11. OH BOY! After the swim, I dried off, chatted with some friends, had a snack and then finally decided it was time to check out the first part of the climb up Lookout Mountain. I followed a group of people out of the downtown area up to the climb. As soon as I hit the climb I remembered driving up this road more than 10 years ago for a fall break trip and being a little scared to drive up the mountain on the windy, steep roads. Now, here I was going to BIKE up this thing. I took a deep breath and switched into my lowest gear. The climb is steep- I’m not sure of the grade but I was definitely thankful I had switched to a climbing cassette a few weeks ago. I pedaled up the mountain, pushing watts, but I wasn’t working overly hard- I didn’t want to blow up before the race even started! Just keep going, just keep going. I looked down at my computer and it showed that I had gone a mile in about 10 minutes. OOF. Tomorrow is going to be a long day. I didn’t let it get me down- I was here at the World Championships- my bonus race! After 14 minutes, I reached a pull off in the road and figured it was a good place to turn around and head back. Oh boy. The way down was super scary. The road had cars on it and it was windy and steep. I tried hard not to ride my breaks the whole time, but when I finally reached the bottom my hands hurt from grabbing my brakes. OMG I really hope the back half of the mountain is not like this. I texted Marni and told her I was nervous about the descent, but she assured me I would be fine and the back half wasn’t as technical. That was definitely reassuring, but I was still a bit nervous about this course. I made my way back to the car to drop my bike before heading back to the Village for the Women for Tri photo. Unfortunately, I was a little too late and missed it! Since I was in the village, merch was calling my name. Le sigh. Always gets me! Finally, I headed back to the hotel to pick up Bill and get some real lunch. After lunch, I packed up my gear bags, got my bike ready, and rested a little before heading back to the Village around 4 to drop it all off. I was a little rushed when we finally got there, because I had plans to meet up with a friend from college around 5, but I got it all dropped and didn’t let myself overthink anything. At 5, I met my friend and her family for what would be a highlight of the trip- a helicopter ride over the course. It was so beautiful and such a fun way to see Chattanooga! Thank you Rock Creek Aviation! Finally, it was time to head back, grab dinner and get to sleep. Tomorrow was race day!